The Dallol volcano has not been the subject of any previous Bulletin reports; however, the hydrothermal features include diverse brightly colored hot springs that are both dramatic and intriguing. An explosive event at Dallol was noted by observers in January 2011. This report was given to us by Tadiwos Chernet. 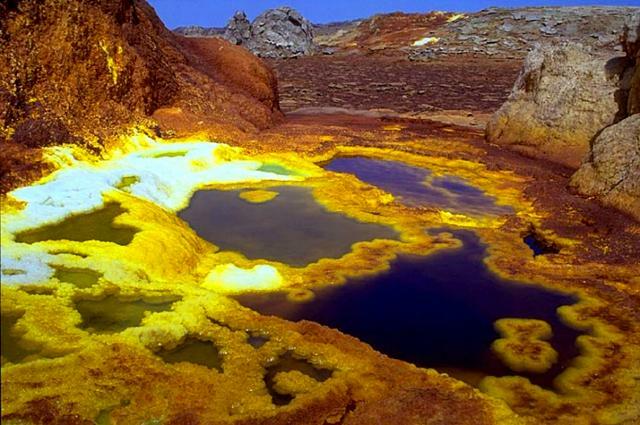 Dallol is located in the Danakil Depression in the northern part of the Afar triangle of Ethiopia. The volcano is on the NNW trending Erta Ale axial, a rift segment that hosts a number of active volcanoes, including Erta Ale, itself the host of a perennial lava lake. The elliptical Dallol (figure 1), which rises gently to 60 m above the salt plain (48 m below sea level), has a summit crater (about 100 m diameter) that experienced a phreatic eruption in 1926. Figure 1. Dallol with salt pools and deposits in the foreground. Photograher uncertain but this photo was apparently online since 2011. Bulletin editors found it on multiple websites including Vieweird.com. Nearby residents of Almeda observed unusual dark colored smoke from the Dallol crater in the first week of January 2011. The event, which was not strong enough to be recorded by satellite remote sensing, left dark-gray ash and sulfur deposits at Dallol hot springs, suggesting degassing from depth. This process was not unexpected given that the region contains many craters, and the Dallol crater, formed in 1926, was the result of a phreatic eruption. Previous phreatic eruptions at Dallol and the surrounding salt plain have left behind bubbling acid brine pools best explained by a number of active maar craters. Those craters are obscured by the thick evaporite succession and frequent marine invasions of the salt plain during the Holocene. Evaporites and Geothermal reservoir. According to Chernet, an adjacent salt-crusted depression that lies 120 m below sea level was linked to the Gulf of Zula on the Red Sea in the Pleistocene by the narrow extensional Alid graben to the N. The Alid graben is floored by fissure basalts and the active Alid and Jallua rhyolitic volcanoes. An evaporite succession in the sedimentary basin is mostly bedded halite, but includes minor inter-beds of clay shale, gypsum, anhydrite, and a thick bed of potash. Citing Barberi et al. (1972), Chernet indicated that the deposits, over 1,000 m thick, have continued for 200,000-25,000 years and attest to a number of marine ingressions into the depression which have left behind a number of brine lakes. At Dallol, a salt dome rises as a notable topographic and geologic feature (figure 1). On the salt dome, several springs with boiling, supersaturated, and extremely acidic waters are discharging on salt cones. Citing Varet (2010), Chernet stated that geothermal reservoirs, which reside below the evaporite succession, evidently recharge from precipitation on the NW plateau. This suggests the potential for a renewable geothermal energy supply in the area. Figure 2. (a & b) Two, 3-dimensional representations of the Dallol dome and the subsurface spring sources venting at the surface to feed surface evaporites. Courtesy of Research and Development Center, (Ministry of Mines, P.O. Box 486, Addis Ababa, Ethiopia). Courtesy of Carniel and others (2010), citing a personal communications from M. Rivas (2006). The salt cones are tall, brilliantly colored mounds of salt with intervening pools of yellow, orange and blue-green brine. These colors may result from oxidation state of species in solution, such as ferrous chloride to ferric chloride. Dallol waters are characterized by very high total dissolved solids (up to 525 g/kg). The waters can be grouped into three chemical suites, all of which contain high levels of chloride. Two representative water samples were collected and analyzed. One of the samples was from a hot springs with a 110C temperature that solidified shortly after collection, indicating salt supersaturation. An X-ray diffraction pattern of the solidified product showed the presence of bishofite (MgCl2*6H2O). The other was a brine water of pH 0.2. The chemical composition of the samples was that of concentrated sea water. According to Chernet, X-ray diffraction of samples from hydrothermal deposits within the crater shows that the major constitutents of most samples are halite, sulfur, calcite,. sodalite, and hematite, with minor levels of silica. Metallic oxides and potassium and/or fluorine impurities have given the sites a brown, yellow, or bluish color. Chernet noted that frequent earthquakes of magnitude 4.5-5.5 occur in the vicinity of Dallol, as reflected by cracks healed with later salt deposits and a number of phreatic eruptions. References. Barberi, F., Borsi, S., Ferrara, G., Marinelli, G.; Santacroce, R.; Tazieff, H., Varet, J., 1972, Evolution of the Danakil depression (Afar, Ethiopia) in light of radiometric age determinations, The Journal of Geology, v. 80, iss. 6, p. 720-729. Carniel, R., Muñoz Jolis, E., Jones, J., 2010, A geophysical multi-parametric analysis of hydrothermal activity at Dallol, Ethiopia, Journal of African Earth Sciences, vol. 58, p. 812-819. (Article cited personal communications from M. Rivas, 2006). Chernet, T., Dallol Volcano and Danakil Depression: Earth Resources and Geo-hazards, 2012, Magmatic Rifting and Active Volcanism Conference, 11-13 January 2012, (Session 3), Afar Rift Consortium, Addis Ababa, Ethiopia. (http://www.see.leeds.ac.uk/afar/new-afar/conference/talks.html). Darraha, T.H., Tedesco, D., Tassid, F., Vasellid, O., Cuocob, E., Poredaf, RJ, 2013, Gas chemistry of the Dallol region of the Danakil Depression in the Afar region of the northern-most East African Rift, Chemical Geology, vol. 339, p. 16-29. Nobile, A., C. Pagli, Keir, D., Wright, T. J., Ayele, A., Ruch, J., and Acocella, V., 2012, Dike-fault interaction during the 2004 Dallol intrusion at the northern edge of the Erta Ale Ridge (Afar, Ethiopia), Geophys. Res. Lett., v. 39, L19305. Varet, J., 2010, Contribution to Favorable Geothermal Site Selection In the Afar Triangle, ARGEO-C3, Third East African Rift Geothermal Conference, Djibouti, 22-25 November 2010, p. 139-154. Information Contacts: Tadiwos Chernet, Research and Development Directorate, Ministry of Mines, P.O.Box 486, Addis Ababa, Ethiopia. The Global Volcanism Program has no Weekly Reports available for Dallol. The Global Volcanism Program has no synonyms or subfeatures listed for Dallol. Numerous phreatic explosion craters dot the Salt Plain NNE of the Erta Ale Range in one of the lowest areas of the desolate Danakil depression. These craters mark Earth's lowest known subaerial volcanic vents. The most recent of these craters, Dallol, lies 48 m below sea level and was formed during an eruption in 1926. Colorful hot brine springs are found in the Dallol area. Another phreatic explosion was observed in January 2011. Remarks: Deformation is due to a dike intrusion, associated with earthquakes. Most of the intrusion occurred before 27 October 2004. Best-fit model assuming a Mogi source, a dike and a fault. (a) Observed descending interferogram, between 22/09/04?01/12/04. (b) Modelled interferogram. (c) Residual. (d) Observed ascending interferogram between 28/07/04? 19/04/06. (e) Modelled interferogram. (f) residual. In Figures 2b and 2e the white filled circle marks the Mogi source, the long thick black line is the upper edge of the dike, the short thick black line is the upper edge of the normal fault and its lower edge is marked with a dashed black line. (g) Observed descending interferogram, between 27/10/04?01/ 12/04. 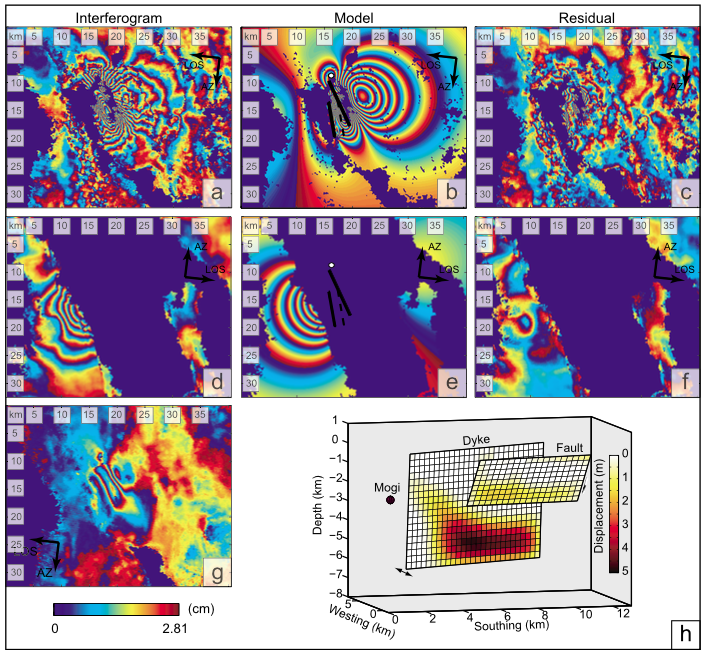 (h) Best-fit model geometry from joint inversion of the interferograms in Figures 2a and 2d. The colourbar below Figures 2g applies to all interferograms. From: Nobile et al. 2012. Reference List: Nobile et al. 2012. Nobile, A., C. Pagli, D. Keir, T. J. Wright, A. Ayele, J. Ruch, and V. Acocella, 2012. Dike-fault interaction during the 2004 Dallol intrusion at the northern edge of the Erta Ale Ridge (Afar, Ethiopia). Geophysical Research Letters, 39, L19305. There is no Emissions History data available for Dallol. Colorful hot brine pools up to about a meter in diameter are dammed by terraces at hot springs at Dallol. Numerous phreatic explosion craters dot the Salt Plain NNE of the Erta Ale Range in one of the lowest areas of the desolate Danakil depression. These craters mark Earth's lowest known subaerial volcanic vents. The most recent of these craters, Dallol, lies 48 m below sea level and was formed during an eruption in 1926. There are no samples for Dallol in the Smithsonian's NMNH Department of Mineral Sciences Rock and Ore collection. Large Eruptions of Dallol Information about large Quaternary eruptions (VEI >= 4) is cataloged in the Large Magnitude Explosive Volcanic Eruptions (LaMEVE) database of the Volcano Global Risk Identification and Analysis Project (VOGRIPA).